Anti-war protesters disrupted a civic reception in Auckland for New Zealand soldiers returning from the Vietnam War. The civic parade was led by the Band of the Royal New Zealand Artillery followed by Land Rovers carrying the gunners of 161 Battery, and troopers from New Zealand’s Special Air Service. The march was relatively uneventful until the column reached the reviewing platform outside Auckland Town Hall. As the parade approached the platform, red paint bombs and fire crackers were thrown on the road. Demonstrators used red paint to symbolise bloodshed in Vietnam. Several paint-covered protesters broke from the crowd and sat on the road. Despite forcing the band to alter course, they only caused a momentary disruption before police removed them. New Zealand’s involvement in the Vietnam War aroused considerable public debate. By 1971 up to 35,000 people were protesting on the streets. Many argued that the conflict was a civil war in which New Zealand should play no part. They wanted this country to follow an independent path in foreign policy, not take its cue from the United States. 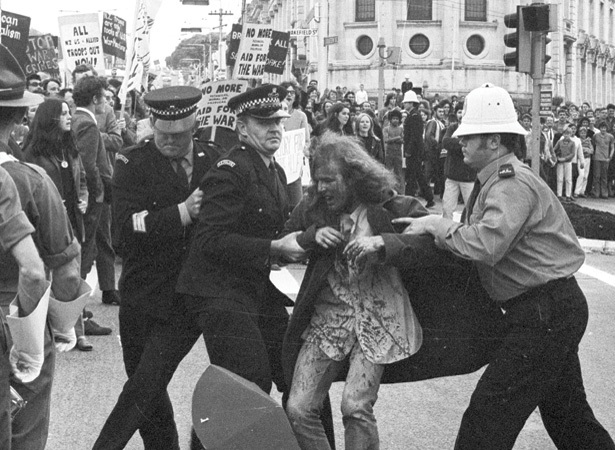 We have 5 biographies, 9 articles, 3 comments related to Anti-Vietnam War protests in Auckland. A summary of this incident is on the www.vietnamwar.govt.nz website: http://www.vietnamwar.govt.nz/memory/john-miller-slide-show. This information was sourced from newspaper reports in the New Zealand Herald (11-13 May 1971). For Progressive Youth Movement (PYM) members’ recollection of this protest and film footage of the parade, see Rebels in Retrospect: http://www.ngataonga.org.nz/feature-project/pages/rebels-retrospect.php. See also Claire Hall, No Front Line: Inside Stories of New Zealand’s Vietnam War, pgs 274-276. I am an American Grad student currently writing a capstone to view the historiography of the supposed "Myth" regarding Vietnam veterans being spit upon, called baby killers, and enduring other forms of abuse from civilians. In the states this seems to be a general idea that has no hard evidence to back in self up, other than numerous veterans accounts. My argument is that the United States was not alone in fighting the war, so possibly, by taking an international perspective with the veterans of American allies there may be more possible truth to the myth than originally thought. For this article above, the introduction supports my argument, however I do not see where this information was found. I assume it is a newspaper report, or something to that nature. If anyone could provide me with this information I would greatly appreciate it, as I wish to use this site and its content as a source in my paper.